On this website, you will learn what the pupils did at the English lessons, what homework they were assigned to, what they had to do for the tests, and also learn about other important information about the lessons. Therefore, we ask that you review this site regularly. If you have any further questions, you can always call or email us. * Super Minds * Dear Parents, we would like to note that the Super Minds curriculum consists of two parts - the first part forms the basis (mandatory) and the second part is superstructure (complementary). The course was designed to suit different types of English programs and to adapt to them depending on how many hours of English each week the children have. In our case, when we have four hours a week, we are able to discuss the basic part (the first six pages of each lesson), but the second part (the other six pages in each lesson) have very little or no time at all. For this reason, you often find the omitted pages in the Student's Book and Workbook textbooks. Teachers of your children will always publish a home assignment on their website so that you can check if your child is discussing a substance that is required. As far as the remaining pages and exercises are concerned, of course we will encourage the pupils to develop them at home if they so wish. Teachers inspect these pages and exercises, and pupils receive extra stars for them as a reward for their efforts. Student's Book includes an interactive DVD-ROM containing animated storybook stories, interactive games and activities including karaoke songs designed for homework. Here are the instructions for registering with the Cambridge Learning Management System . You can find the code to activate within the Workbook textbook. These are complementary activities to a textbook that are designed for homework. We do not work with them in the lessons. Today in class the students corrected the homework that was due today, WB pgs 98, 99 and the positive and negative things about the four jobs they received in class last week. To introduce the Easter holiday topic today, the students participated in an Easter Egg hunt in the classroom. In two teams, the students had to find their eggs in the class. Instead of collecting them, they left the “egg” and ran back to their partner to describe its location. The other partner wrote down the location in the classroom. After the two teams found all their eggs, the groups then switched papers. The two groups raced each other to find the other team’s eggs, using only the directions the other team wrote in the first activity. Today we visited the Star Store, and the students got to choose some rewards for participating and coming prepared to class. In groups, the students talked about the positive and negative things about the Easter holiday. We talked about time off school, visiting family, sweets, birthdays, dying Easter eggs, etc. We also talked about some typical Easter traditions, and where they maybe come from. To “answer” the question Why are the Easter Bunny and dyed eggs so important on this holiday?, the students worked in groups. Each group created a short comic with some writing, explaining why this tradition is so common now around the world. At the end of class, the teacher displayed the comics and the groups retold their stories about the Easter bunny and dyed eggs. Today in class the students wrote in their portfolios. They answered the question: “What do you think is the most interesting job, and why?” They picked a job and wrote 4-5 reasons why they think it’s interesting, and also a reason the job may be difficult. Then they read their responses to the class and the other students made comments or suggestions for other ideas. In pairs, the students talked about the crazy jobs on SB pg 100 for a few minutes, and decided which job was fake. Then, we completed a listening activity and the students checked their answers. The students reviewed the worksheet they completed on Monday, about skills they are good and bad at. We talked about the different skills and then the students interviewed each other about what they like and don’t like. With their interview information, each student had to decide what the perfect job for their partner would be. They looked at all the good and bad skills, and wrote a short description about why this job is perfect for their partner. Then they presented their ideas in a 45 second presentation. Today in class the students turned in their homework, SB pg 101, WB pg 101, and the worksheet about job skills. As a group, we read through and corrected the homework, and we talked about some of the themes--different jobs, interview questions and answers, etc. In their portfolios, the students thought about the word “museum”. They wrote as many words as they could think of about museums, and then they added more ideas from the pictures on SB pgs 98-99. They also practiced some new vocabulary to talk about what they saw in the pictures, and about their own ideas. Together in a circle, we read the story on SB pgs 98-99. The students practiced their pronunciation and speaking skills, and we also talked about the story and what they thought about it. After we finished the story, we did a bit of practice with completing sentences with our own ideas, using activity 3 on SB pg99. In groups, the students worked together to solve two word puzzles at the bottom of SB pg99. It was quite a challenge, but they found the answers in the end. Homework: WB pgs 98, 99; in class each student was given 4 jobs on a piece of paper--for homework, write sentences for two positive and two negative things about each job. Today in class the students reviewed activity 2 and 3 on WB pg97 because many students unfortunately didn’t finish the homework assignment. They practiced making questions using the form “What will you do if ____?”, getting ideas from the pictures on the page. Then, in their portfolios, the students thought of answers to the questions they wrote in the first activity. They shared some of their ideas, and compared their answers with their classmates. They practiced using the form “I will___.” to express their ideas. On SB pg97, the students listened to and then read the dialogue about making plans for Sunday. They quickly skimmed for the six suggestions, and read why the friend disagreed. As a group, we read through the dialogue on SB pg 96. Then, the students listened to the dialogue and followed along in their books. We talked about the subject, Maths, and which jobs need Maths, engineer and businesswoman. In small groups, the students wrote their own dialogue. The situation was studying for a test--the students had to think of a school subject, two jobs that need this subject, and why the subject is important. Once they finished writing, the groups presented their dialogues to the class, and the other students gave them feedback. At the end of class, we watched a video from a storybook to further practice this grammar structure. Today in class the students turned in their homework from last week, WB pgs 94, 95, 96, 97. We corrected the pages together, and also talked about the vocabulary (jobs) and the new grammar structure (If you _____, I will ____). If they didn't finish the homework, they had a bit of time to try to complete some of the activities to prepare for the rest of the lesson. The teacher returned the Unit 7 test the students completed last week, and the students could ask questions and see their results. At the board, the students looked at pictures of different jobs. Each student secretly chose a job, and then described the job with three sentences. The other students tried to guess which job they were talking about. We reviewed the structure “If I (verb), you will (verb)” some more, and then the students completed a listening activity on SB pg95. They listened to an advert for a new robot, and then had to match the coloured button with the function of the robot. Today the students had a short class because they went to the theatre earlier in the day and didn't get back til later. In class, we talked about poems. The students read some examples of funny poems on SB pg90. We talked about if the poem rhymed, what the poem was about, and if the poem was funny. We also looked at the picture with each poem to better understand the theme. As a group, we talked about different types of poems, and of any poems they knew or remembered. We looked at three types of poems on SB pg91, and the students looked at the examples and decided the form for each. The students looked at "acrostic poems" and picked a word to write their own acrostic poem. As a competition, the teacher wrote four words on the board (two, bed, green, hot) and each student had to write as many words that rhyme in three minutes. Then we compared lists to see how many words we could think of as a group. Students were once again in a combined class today, and class began with the students completing a Complete the Sentence exercise to review present perfect + just and making offers and promises using will (for the Unit 7 test). Then, all the students practiced the past participle (3rd form) of common regular and irregular verbs by writing past participles on mini-whiteboards with partners. Lastly we corrected the homework (due today) as a final review of the Unit 7 material. After the break, students took the Unit 7 test. Then, we started getting introduced to Unit 8 — Museum from the Future — and played a pantomime game to start brainstorming different jobs/careers/occupations. HOMEWORK: in the Workbook, pgs. 94, 95, 96, 97 - due MONDAY, 1.4. Today we had a lot of fun working as a big group! Class began with students practicing writing a summary of their favorite book/film. We also reviewed words that end with a silent "e", and we had a contest to see who could make the longest sentence using only words ending with a silent "e". Then, we reviewed the present perfect using just with a pantomime game — this allowed the students to practice the present perfect structure, and the 3rd form of verbs. (*HINT* — for the test on MONDAY, it would be good to know ther 3rd form of the verbs: buy, pass, decide, and get). After the break, students had a race to make sentences using the Unit 7 vocabulary, which the teacher had written on slips of paper and hidden around the room. Lastly, we watched a short cartoon of Romeo and Juliet and students shared short summaries of their favourite book/film. HOMEWORK: WB pgs86, 87 and SB pg93 DUE Monday, 25.3. UNIT 7 TEST MONDAY, 25.3. On SB pg86, the students looked at the story quickly to find the answers to the questions How do the children think Shakespeare should change the end of the play? and What do the audience think of the new end of the play? After we finished reading the story, the students put sentences in order on SB pg87. We talked about what happened in the story, and the students explained what they liked or didn’t like about it. At the end of class, the class played a game in teams at the board. The students raced to spell vocabulary and phrases from the story. Then, the students had to think of the third form of the verb the teacher told them (write-->written; be-->been). Today in class the students practiced responding to requests and problems using “I’ll_____”. They responded to ten situations, and then they compared answers with their classmates. On SB pg84, the students looked at the pictures and named what they saw. Then we talked about what a “duet” is. As a group, we listened to the song, and the students had to listen for the mistakes in the lyrics. If they heard a mistake, they wrote down the correct word in their student’s book. At the board, the students took turns racing each other to correctly spell words that end with a silent “-e” (i.e. house, theatre, promise, please, blonde). They won a point if they correctly spelled the word first. We talked about the structure “I’ve just _____” to talk about things that finished a very short time ago. The students practiced making sentences using “I’ve just _____” to talk about things they finished before coming to class. The students looked at the pictures on SB pg85, showing mimes with different emotions. The students matched the sentences below (He’s/She’s just _____) to describe why the mime is showing the emotion (He looks hurt-- “He’s just cut his finger”). Today in class the students turned in their homework, WB pgs82, 83, and SB pg89. They also returned their city map, completed at home with colour, detail, descriptions, and a compass for an extra star : ) We checked the homework together as a class, and the students explained and discussed their answers. In their portfolios, they wrote as many words as they could using the letters from “Shakespeare”. It was very fun seeing how many words they could think of in three minutes! On SB pg82, the students looked at the picture and then read the text about William Shakespeare. Then we completed a listening exercise which introduced some details and ideas about Unit Seven. On SB pg83, the students looked at the objects and named them. Then, each student had two objects to listen for in an audio clip, and when they heard their objects mentioned, they raised their hands. Then we read the dialogue and the students figured out which person brought each object. We played a game as a group using some flashcards. The students read the situation, and then one student had to find the correct response using “I’ll _____”. Then they read the next situation for someone to answer. We repeated this until all the cards were used. Today in class the students practiced writing directions. In their portfolios, they wrote the steps for their journey from home to school in the morning. They practiced using phrases such as “turn left/right”, “go past/through/ ___”, “It’s past/before/next to/between ___” and “go straight until ___” to describe their way. Then the students shared their sets of directions, and the other students tried to follow along and draw a map on their paper using the directions. As a group, the students practiced giving and using directions with a game. One student closed their eyes, and the others hid a ball somewhere in the class. Then the students gave the “blind” student directions to the ball, using some of the phrases they learned/practiced during the portfolio activity. Today in class, the February Student of the Month was announced: Kate! She got the award because she is working hard to come to class with her homework completed, and also makes the effort to bring in book reports for extra English practice. The students turned in the homework due, WB pgs 74, 78, 79 and SB pg 78. We checked their answers as a class, and they shared some of their ideas for the open-ended questions. To prepare for the test, we worked on SB pg123 together and reviewed the grammar topics: “Could I…”, “Do you mind if...”, and using should/shouldn’t correctly. The students also quickly quizzed themselves on the vocabulary from Unit Six. The students completed the UNIT SIX EXAM. After they finished the exam, they looked at the box of library books and decided to check out a book if they wanted. Library books are due back in class on MARCH 25TH. At the end of class, we looked at the new homework together, so the students knew what to do for each activity. Homework: complete WB pgs 82, 83 practicing the new vocabulary of Unit Seven and using “will” to talk about promises and offers. Read the story on SB pg89, and match the sentence halves at the bottom of the page. DUE MONDAY, MARCH 11TH. Today in class the students practiced using the polite phrases “Could I…?” and “Do you mind if…?”. They filled in the missing word in the boarded sentences and wrote them in their portfolios. Then they had to create a response for each question, practicing using “Not at all.” and “Yes, of course.” appropriately. We completed a listening exercise on WB pg76. The students listened to a conversation, and had to figure out which souvenir each person got while on holiday in Istanbul. At the board, we played a game where two teams of students raced to think of an object. The teacher gave clues (It is made of fabric. Each country has a special one. It is like a symbol.) and the students had to correctly write the word on the board (flag). Together, we wrote questions for the interview activity on WB pg77. In pairs, the students asked and answered questions to complete the interview information. Once they finished, they looked at a dialogue in part 2 and put the sentences in order. Using the dialogue as a model, the students wrote an original dialogue with a partner about buying a present or souvenir. They had to create characters and a situation, and use some of the key phrases from Unit 6 in their writing. Once they finished writing and the teacher checked the English, the students presented their dialogues to the class. Today in class the students reviewed the homework due today, WB pgs 72 and 75, and SB pg 76. We talked about the exercises, grammar and vocabulary in class, and the students corrected their work. The students also shared their ideas and gave each other feedback. As a class, we talked about times we were “lost”. The students gave examples and explained situations, and then we talked about the best things to do when you get lost. On SB pg74, we began reading the story “Lost in the City”, about the children exploring the city of Istanbul. We talked about what the characters did in the story, and if we would do things differently. To show what they understood about the story, the students fixed the statements on SB pg75 about the story. At the end of class, we talked about the new homework that is due on Monday, March 4th. Today in their portfolios, the students made a list of four countries and three people they know. Then, they had to think of a souvenir from each country for each person (so, 12 souvenirs total). Then, we played a game where the student shared their list for a friend, and the class had to guess what country it was from. They could ask for a clue (What continent is it from? ), or they could make a guess (Is the key chain from Germany?). On SB pg 72, the students looked at the picture and guessed what the situation was. Then, we did a listening activity and they tried to remember the important information from the dialogue. In pairs, the students “created” four items for own shop. They drew a picture of each, and then did a role play of buyer and seller with a partner. They practiced using the phrases and polite language from the dialogue they listened to earlier, and also from their homework. WE HAVE STAR STORE ON MONDAY!!! Today in class the students brought the homework due, WB pgs 70, 71, 73. We corrected the pages together as a class, and talked about some of the new vocabulary and grammar in Unit Six. In their portfolios, the students talked about their spring holidays. They wrote a short story about their holiday in general or something special that happened to them. Then they shared their stories with the rest of the class. The students looked at SB pg70 and named everything they saw in the picture. The students listened to an audio about the picture, and had to answer questions describing the situation. At the board, the students played a drawing game. One student drew a souvenir on the board, and the other students had to correctly name the object as fast as possible. On SB pg 71, the students worked together to complete some recommendations for visiting Istanbul on holiday. They practiced using the structure “You should / You shouldn’t _______” to talk about good and bad ideas for things to do when travelling. At the end of class, we talked about the new homework due next Monday, February 25th. Homework: complete WB pgs 72 and 75; complete the activities on SB pg 76: match the country names to their flags, read the text and match the paragraph titles, and then think of two good souvenirs from each country listed at the top of the page on your own paper. Today in class the students practiced describing and talking about people. The teacher looked up pictures of celebrities, and in their portfolios, the students wrote six clues about a person they saw. Then they shared the clues with the other students. The students got more “points” if they guessed the correct person with fewer, more difficult clues. The students looked at the pictures on WB pg69, part 3. Using the pictures and their own imaginations, the students wrote their own stories about what happened. Then they took turns reading their stories aloud to the rest of the class. Together, we talked about the "wanted posters" and "rewards" in the Wild West, and used SB pg68 to get some ideas. We read the description together, and talked about what information was included. Homework: WB pg 70, 71, 73. DUE MONDAY, FEBRUARY 18TH. HAVE A GREAT HOLIDAY, AND SEE YOU FEBRUARY 18TH! Today in class the students corrected the homework due. We talked about SB pg67, and corrected the homework on WB pgs62 and 67. We also worked through SB pg123 as a class to review the grammar topics of the unit and prepare for the test today. In teams, the students played a game to practice the “Wild West” vocabulary. The students looked at a picture and had to write the word on the board as quickly as possible, and correctly! The students completed the Unit Five test in class. After they finished the test, the students had time to look at the library books and check out a book **if they didn’t already have a late library book at home**. To introduce the new homework, we worked through WB pg70, part one. There was a listening activity the students completed, which practiced some of the new vocabulary in Unit Six. At the end of class, the students played a round of “Hot Potato”, with the theme “things you give as a souvenir”. Today in class the students brought their homework, WB pgs 60 and 63 and the clues for 5 objects. The teacher collected the clues. As a class, we talked about the homework pages and corrected their answers. In their portfolios, the students wrote a response to the prompt: “If I lived in the Wild West, I would...”. They thought about jobs, where they’d live, and what life would be like. Then they shared their answers with the class. We sat in a circle and read the story “The Bank Robbery” on SB pgs 62-63. The students took turns reading aloud, and they answered questions about what was happening and details in the story. After we finished reading the story, the students talked about what they would change in the story, and the things they enjoyed about the story. At the end of class, the students read aloud their clues about 5 objects to the rest of the class, who guessed what the objects were. Today in class the students used their portfolios to practice using the apostrophe correctly when talking about people's things. They change phrases to use the possessive apostrophe, and then we checked the answers and revised the rules together (i.e. the pencils of the students --> the students' pencils). The students looked at the song lyrics on SB pg60 and guessed the missing words, using the context and their own knowledge. Then the students checked their predictions by listening to the English song lyrics. We played "Guess Who?" as a group. One student sat at the board and couldn't see the other students. The others picked someone to describe, and gave the person clues to figure out who they are talking about. The students were given a picture to describe. In three minutes, they had to write as many sentences describing the characters as they could. The students read their sentences aloud, and shared their observations. The students did some more practice with using the apostrophe correctly on SB pg61. They had to follow the lines to match the items, and then read the sentences to say if they were true or false. We talked about the answers together, and the students explained why they were correct. As a competition, the students took turns writing at the board. The teacher said a word, and the students raced to spell the word correctly. They mostly practiced words that have double consonants (i.e. swimming, flipped, bottle, running, spelled). Today in class the students brought in the homework due today, WB pgs 58, 59, 61. Two students had to take the Unit 4 Exam due to absence, and two students had to finish their missing homework during class time. Together, we looked at SB pg58. The students scanned the picture and named any objects they knew. Then, the students guessed what was happening in the picture. They completed a listening exercise to check their ideas. In their portfolios, the students practiced the new Unit 4 vocabulary by creating a ”picture dictionary”--they listed the words, and then drew a picture for each. On SB pg59, the students completed an exercise to practice the phrases “made of” and “used for” for describing different objects. Then the students created their own clues to describe objects in the classroom. The student shared their clues with the class, and the others had to think that object they were thinking of. Homework: complete WB pgs60, 63; write clues for five different objects. For the five objects, write three sentences for each object: It’s a ____. It’s made of ____. It’s made of ____. Today in class the students had a competition in their portfolios: they had to think of and write a food for each letter of the alphabet (A-Z). Then they compared their answers, and the most original answers received one point. The students turned in their recipes on Monday, and today we did a fun activity with them to practice cooking and recipe vocabulary. The students each got one of their classmate’s recipes, and they had to pantomime the directions for the class. The students shouted out their guesses, and the actor had to explain without words. It was very funny, and everyone did so well! To practice more food vocabulary, the students played a drawing game--one student got a flashcard with a food, and drew it on the whiteboard. The other students had to quickly name the food item, before the other students. At the end of class, the students worked in teams to plan a menu (starter, main course, dessert, drink) with random food items. Then they presented their ideas to the other team. Today in class the students corrected the homework due, WB pgs 50 and 57. We worked through them as a class using the projector, and practiced some of the skills we need for the test. In pairs, the students completed some exercises on WB pg 56 to further prepare and revise for the test today. They also did some practice at the whiteboard to be ready for the listening part of the test. After they finished the test, they each chose a library book if they wanted. Library books are due back on Monday, January 28th. Homework: complete WB pgs 58, 59, 61, which practices the new Unit Five vocabulary, how to describe objects, and how to talk about people’s things. Due Monday, January 21st. Today in class the students answered the question: “What is the weirdest food you have ever eaten?” in their portfolio. They talked about what it was, when and where it happened, and who they were with. Then they shared their experience with the class. On SB pg50-51, the students looked at the pictures and named any objects they could in the pictures. Before we started the story, the students predicted what the story was about, and what would happen. The students quickly read the story silently to answer the question “Why does the robot want the children to do the washing up?”. Then we read the story together. The students sat in a circle and took turns reading, using a funny voice for when the characters said something. We talked about the story, and then the students answered questions.. In teams, the students wrote an original menu for a weird restaurant. They had to create starters, main courses, desserts and drinks with a theme they chose. They stood in front of the class and presented their menu ideas to the other students, and then answered questions. Homework: WB pgs 50, 57; recipe in English. Due Monday, January 14th. Complete SB pg 122 for extra test practice, and extra stars!! Today in class, Ester received the December Student of the Month for coming to class with her homework finished, and for doing extra, quality work to receive even more stars! (finishing book reports, extra workbook pages, etc.) Great job to Ester! As a class we talked about recipes and the two parts, "ingredients" and "directions". The teacher used the example of pancakes, and the students thought of what to write in each part of the pancake recipe. In their portfolios, the students wrote down a recipe for a dish they like, including a list of ingredients and the directions for how to make it. Then each student shared some of their ideas with the rest of the class. In groups, the students had four conditional sentences to complete (adapted from WB pg49, #1). Each group finished the conditional sentences to make sense (i.e. "If you want an apple, ______" --> you go to the shop to buy one.) Then the students did a fast exercise at the board to further practice making conditional sentences. At the end of class we talked about the homework for next week. Everyone must complete WB pgs 50 and 57. Also, everyone must bring in a recipe in English. It can be for any kind of meal or dish, but it must be in English and it must include ingredients and directions. The recipe can be handwritten or printed, and you need to bring it on paper with you for Monday's class. Welcome back from the winter holidays! Today in class the students wrote in their portfolios about five things they did over the break. They practiced writing using ordinal numbers (i.e. On the twenty-fifth of December, I opened presents.) Then they shared some of their highlights with the class. We talked about sweets the students ate over Christmas, and about their favourite kinds and flavours. We looked again at SB pg52, and matched the kinds of sweets in the text with the pictures. The students judged whether each crazy sweet was a good or bad idea. At the end of class, we played Hot Potato with the themes “food” and “things in the kitchen”. The students had to quickly think of a word that fit the theme, and then passed to another student. The students checked their homework, from WB pgs 51 and 55, and SB pg52. We compared answers as a class, and the students took turns offering ideas and input. In their portfolios, the students wrote down five ideas for things they are going to do over the winter holiday. They practiced writing sentences using the structure “going to” correctly. For a speaking activity, each student had a card with a different idea (i.e. “___ people in the class wake up after 10am on Sundays”), and they had to ask each student in the class their question so they could count how many people said yes and no. Then, each student shared their results with the class. To review telling time in English, the students found partners to play the game "Battleship". Each student had a grid with times at the top and days of the week on the side, and they filled in boxes. Then, the partners took turns asking the question "Are you doing anything at quarter to nine on Friday?" The students raced to find all of their partner's filled in boxes first. Enjoy the Holiday Party on Friday, and have a great winter break!!! Today in class the students wrote in their portfolios to practice using numbers in order (first, fifth, eleventh, twentieth, etc...). They completed sentences with the correct word, spelled correctly. Then we compared and corrected answers as a class (i.e. May is the fifth month of the year). As a class, we did a listening exercise on SB pg48 about a birthday party. The students listened for the details, and then filled in the missing information. We discussed what makes a good party (place, people, time, food, presents, activities, etc). Then in groups, the class used these guidelines to plan their own perfect party. Each group presented their plan to the class, and the audience asked questions about their ideas. On SB pg49, the students read about a scientist who makes food for the future. Then the students were inspired to “invent” their own food of the future. They worked in pairs to create four new foods, using the structure “If you pour/put ______ on the ______ pill, you get ______”. Then the teams took turns sharing their ideas to the class. **NOTE: Monday, December 17th, is Star Store!! Today in class the students corrected the homework due today, WB pgs 46-48. We did a variety of activities to correct the homework and practice some of the new Unit Four vocabulary and grammar. We worked as a class to practice writing and saying dates properly, and also did some problem-solving with calendars and a logic puzzle. We also reviewed some old vocabulary, such as the days of the week and the months of the year. In their portfolios, the students wrote down 4-5 ideas about how food will be different in the future (what it looks like, how we eat it, what it tastes like, etc.) Then they shared their ideas and also guessed when it will be like this (in 2019, 2030, 2050, 2100, 2500). Today in class the students brought their notes about the musician or band they chose to research, as well as a picture or photograph. With these materials, they had some time to prepare their presentation to the class. In their portfolios, they wrote down notes for their presentation, using the information they found and recorded on their Musician Biography worksheet. The students took turns presenting to the class. They gave some information about the musician or band, some history, and some personal opinions about music and their chosen topic. Then the audience asked the presenter some questions about the topic, the presenter's favourite music, etc. In the second half of class, we focused on “rhythm”. We looked at SB pg42 to introduce the idea of rhythm, and we practiced clapping the rhythms together. Then, on SB pg43, the students used the examples to make their own rhythms using English words, which they performed for the class. At the end, we read some poems with special rhythms on WB pg43. The students had to guess which poem it was based on the rhythm they heard, and then we clapped the rhythms and said the poems together as a group. Today in class the students corrected the homework due today, WB pg41. They also showed their work on the Musician Biography to the teacher to receive their homework star. We worked through the “extra homework” as a class (WB pg37 and SB pg121), which reviewed the important topics for the Unit Three Test. Students who completed it for extra stars shared their work with those who didn’t complete the extra homework. Together, we reviewed and practiced for the test today with some games and competitions adapted from WB pg44. The students completed the Unit Three Test in class. After they finished the test and double-checked their work, they had time to look at the library and check out a book if they wanted. **Note: for class on Friday, PLEASE remember to bring your musician biography form, so you have information for your short talk to the class! **Note: They have two weeks to complete a book report and return the book to the library. The due date for the library books and book reports is Monday, December 17th. All library books MUST be returned before winter holiday!! Today the November STUDENT OF THE MONTH award was given to Natalie, for coming to class with her homework fully completed, and bringing everything she needs for class. Great work! The students practiced telling time in English by playing a game. They each had cards with a clock or words on it, and they had to talk with their classmates to find the match. We talked about the positives and negatives of being famous, and the group had some very good ideas to share. Each student got a piece of paper with a different role on it (electric guitar player, bass guitar player, drummer, lead singer, backing singer, bodyguard, dancer), and they had to plan a holiday for their person. They used the structure “He/She is going to _____” or “He/She is not going to _____” to list five plans. Then they shared their ideas with their classmates, and the others had to guess what the person’s job was. Today in class the students corrected their homework together (WB pgs 38-40). Everyone participated in various activities and shared their ideas with each other. On WB pg37 #1 they practiced writing time. Students who finished quickly also looked ahead and worked on #2, 3. At the end of class, we talked about the homework, the extra practice, and THE UNIT THREE TEST ON MONDAY, DECEMBER 3RD. Homework: complete WB pg41. To begin our Unit Three project, complete the worksheet with your research on a musician / band / singer you like (they can be Czech--it doesn’t have to be an English-speaking musician). This research will be used to give a 2-minute presentation in class on Wednesday, December 5th, so it is very important that you have it ready in class on Monday to use! You can also use SB pg44 for ideas on what to write. Due Monday, December 3rd. **NOTE: for extra practice (and extra stars!! ), you can complete WB pg37 to practice time, or SB pg 121 to prepare for the Unit Three Test. Today in class students focus on the topic of "Thanksgiving Celebrations". In their portfolios, students wrote down as many words related to Thanksgiving as they could in two minutes, and then compared their answers with a partner. We watched a video about the history of the Thanksgiving Parade in New York City. The students looked for different vocabulary words during the video (parade, float, marching band, balloon, cheerleader, route, character, clown, dance performer, celebrity, musician). For inspiration for their project, students watched a "behind the scenes" video about the parade, seeing how the parade is planned and organized. Every student had to plan and float for the Thanksgiving parade. They need a) a character, b) a celebrity, c) a balloon, d) a float, and e) a parade route. They wrote down their ideas, and used their extra time to draw and sketch of their plan. Today in class students have corrected the homework , WB pgs 34-36 . We went over the correct answers in the classroom and reviewed some of the vocabulary and grammar of Unit 3. In their portfolios , the students talked about their favorite type of music , and why they like it so much. Then they shared their thoughts with the rest of the class. We looked at SB pg34 and the students called out what they saw, and what they thought was happening in the picture. Then they completed the listening exercise on pg 34, # 2 to check if their ideas were correct. In pairs, the students read aloud an interview on SB pg35 . One student was the interviewer and the other was the rock star Suzy. The students looked for details in the interview, and underlined when one of the characters used " going to ______ ". We talked about how the structure " going to " is used, and why they used it in the interview. Homework: complete all of the WB pgs 38-40 , practicing the musical vocabulary, reading skills, telling time in English, and writing questions. Due Monday, November 26th. Today in class the students responded in their portfolios about eight rules they have at home . They used ideas from SB pg25 and practiced using the structure " I have to ____ " and " I do not have to ____ ". Today, students have " to " and " do not have to " with different activities. The students looked at a comic of aliens in their houses, and imagined the alien's crazy house rules. Using the pictures, they shared the rules using the " have to " structure . This is a practice to "have to" and "do not have to," the students talked about the requirements for different jobs (a doctor, a teacher, etc.) We played a game of Where the teacher gave clues training, you have to bring your passport to work) and students have tried to guess the job as fast as they could (It's a pilot!). The students got points for guessing, and we played several rounds of the game. The students then created their own clues , based on whatever job they chose (a model, an astronaut, etc.) They made a list of 5 things the person has or does not have to do in their job. Each student shared their clues, and the rest of the class guessed the job. Homework : complete WB pgs 34-36 , due Monday, November 19th . We talked about the homework pages and all the exercises on these pages should be completed at home and ready to be corrected on Monday, Nov. 19th. Today in class we corrected the homework together in class. We looked at SB pg23 and WB pg27 , which worked on the Unit 2 vocabulary and grammar . Students switched books and corrected each other's work. The students did some activities and games to practice for Unit 2 Test . The students worked in teams to correctly spell unit 2 vocabulary on the board, given a tip from the teacher (ie, it is an animal that lives in trees, and is very slow - a sloth). The students worked in teams at their desks to find errors in sentences on WB pg32, part 2. Then they wrote their own creative sentences in part 3, practicing using "have to/ don't have to" correctly. The students completed the Unit 2 exam. When they finished, they double-checked their own answers and turned in their test to the teacher. Everyone took some time going through the EATS library and students checked out a book if they wanted. Library books are due in two weeks, on November 26th. If you complete a quality book report when you return your book, you can earn two extra stars! Homework: complete WB pgs 34-36, due Monday, November 19th. Please look over the homework pages before next class so you can ask questions if you need! **NOTE: Here are some photos from the Halloween Party! We all had a fun time, and the costumes were brilliant! Today in class the students practiced writing large numbers in their portfolios. The teacher read numbers to them, and they wrote them down in number form. Then they checked their answers as a group. To review rainforest vocabulary, we did some activities and games to practice. In teams, the students used a picture and some clues to revise vocabulary (beak, toucan, jaguar, anteater, anaconda, pool, creeper, branch, sloth). They also played a game, True or False?. Someone said a fact about the rainforest (i.e. Sloths move very quickly; Anteaters don't like eating ants), and they had to move to the classroom cupboard if it's true, or to the classroom door if it's false. In the second half of class, the students did a listening practice on SB pg28. The students looked at cards with information about different animals, and they listened for the missing information (name, where they live, what they eat, their size, how long they live). As a mini-project, the students chose an animal for an original fact card. They used information they knew, or asked the teacher to look up information on the internet, and they filled in information about their animal. Then they presented their data to the class. NOTE: Test on Monday, November 5th. To prepare, you can complete extra workbook pages for extra stars!! Today in class we presented the October Student of the Month Award to Viola, for coming to class prepared with her books and homework and a positive attitude. Congratulations! In their portfolios, they practiced writing numbers between numerical and written form. Then they checked their answers with the rest of the class. (i.e. 2 000 000 --> two million; three hundred fifty six --> 356). Today we focused on the story, "The Present", on SB pg26-27. The students looked at the pictures and used the vocabulary they learned to talk about what they saw, and then predicted what would happen in the story. We listened and read through the story together, stopping to talk about what was happening. We also talked about new or unfamiliar words we read in the text. After we finished reading the story, the students formed groups to put sentences from the story in order quickly. Then they used the work to retell the story. Part of the story is about being polite in different cultures, so we talked about what people do in the Czech Republic to be polite and friendly. To introduce the homework assignment on WB pg27, we looked at the pictures and decided what they were doing in the pictures to be polite or rude in Thailand. Homework: finish WB pg27 ALL about how to be polite in different cultures; complete SB pg23, #1 to practice reading skills and understanding numbers in numerical and written form. Today in class we talked about the homework, which was the large numbers worksheet and WB pg 24, #1 and #3. We worked through the answers in class, and the students checked their work. Today is Halloween Day! To start, the students worked with Halloween vocabulary in their portfolios. The students unscrambled Halloween words in teams (skeleton, haunted house, blood, ghost, witch, bones, jack o lantern, pumpkin, trick or treat, monster, autumn, spider). Once they figured out their set of words, they explained their vocabulary words for other students to guess. In the second half of class, the students created a spider web using sticks and string. This was a problem-solving activity, because this is a very difficult task! Once they figured out how to create the web, they put spiders on the spider web. Homework : none! Enjoy the EATS Halloween Party today! Today in class the students presented their comics and also turned into the worksheet due today. In their portfolios , they have completed these two sentences to practice the past continuous tense: 1) While my dog ​​_______, my brothers _________. 2) While I ________, the students _______. The students who needed to retook the 2nd listening section of the Unit 1 Test . Then they were given back their tests to bring home, including the additional section from today. Today's topic was How to Play a Game , so students thought of a game they often play, and had to think of 2 sentences to explain the game using the structure " You have to _______. " In the second hour, the students did a listening exercise on SB pg24. They listened to two kids talk about how to play a game, and they had to listen for details about how to play the game "Jungle Jake". They also underlined every time they saw the phrase "have to". In two teams, the students had to imagine rules for a new game. The teams were given the game titles "Anaconda!" and "Toucan Trees," and they made a list of 5 rules using the phrase "You have to ________." Today in class we were with Mr Ryans' class, since we were visiting The Star Store! In their portfolios, they answered the question: What are three fun things you did last weekend?Then the students shared the highlights of their weekend with the class. We made a mind map on the board around the word "rainforest", and the students, in groups, thought of 6 words related to the topic. They wrote their ideas on the board, and then everyone compared answers. In the second half of class, we looked at SB pg22 to learn the new vocabulary (creeper, jaguar, beak, toucan, anaconda, pool, branch, anteater, sloth). To practice vocabulary, the teams played Scattergories. With the five categories (country, plant, reptile, mammal, bird), the students had to think of a word that starts with the same letter as the one given by the teacher. (i.e. "C"--Chile, cactus, crocodile, cat, cockatoo). At the end of class, the students split into two teams for a board race to practice large numbers--the teacher called out a number, and two students raced to point to the number first. Today in class the students shared their homework from WB pg 20, #1, 2. The students wrote in their portfolios about three things I want to do at the weekend, and then they read their ideas aloud to the class. To prepare and review for Unit Test 1, everyone worked in groups to unscramble vocabulary words from unit 1. Then they created their own word scrambles using words from the SB. In two groups, the students looked at pictures from WB pg 21, #3. First, they used their own words to describe what was happening in the pictures. Then, they used the sentence prompts to retell the story. In the second hour, the students completed the Unit 1 Test. Once they finished the test, they were given 10 minutes to develop a comic strip. The comic strip had five boxes, each with a different time. They had to draw and write about a character (their choice) and explain what they were doing at each time. Homework: create an 8-box comic about any character. Each box must include a coloured drawing and a sentence or two about what is happening in the story. Due Friday, Oct 26th. **REMINDER** Star Store is on Monday, Oct. 22! NOTE: Only two students completed their homework today. Remember, if you don't finish your homework, you lose a star for the day! In their portfolios, the students wrote three questions they wanted to ask the presenters after their talks about a natural disaster. Viola and Ester presented on the natural disaster they chose. After, the other students asked them about the topic and what it was like researching and preparing their presentation. The students played a game on the smartboard to practice spelling the vocabulary words from unit 1. In the second half of class, they worked together in pairs to finish a practice activity with the past continuous tense, and then they worked separately to fill in the correct past continuous verb for the sentences to make sense. In pairs, the students worked on WB pg 20, #3 to complete the sentences in a crazy and funny way. Once they finished, they shared their crazy sentences with the class. REMEMBER TO COMPLETE YOUR HOMEWORK, SO THAT YOU ARE READY FOR THE UNIT ONE TEST ON FRIDAY! Today in class the class revised vocabulary related to last class with the portfolio question: What is the scariest natural disaster, and why is it so scary? NOTE: We talked about the homework due today, which only one student completed. Therefore we were not able to do our presentations today. The presentations have been rescheduled to Monday, Oct. 15. Everyone reviewed different types of natural disasters and some information they know about each. The students participated in an acting game, where they had to act out a specific natural disaster and the other students had to correctly identify and name it. In the second half of class, the students completed a listening and speaking activity on pg 17 of the workbook in pairs. In two teams, the students completed a quiz where the teacher described a situation and the students had to identify and correctly write the vocabulary word. Homework: complete workbook pg 16, #3 using complete ideas (don't just write one or two words!) Also, everyone MUST have their 5 facts about their chosen disaster written down and ready to share in the presentations on Monday. MDR: What were you doing yesterday at 18:30? Story: Students predicted what would happen in the story based on what they saw in the pictures, then listened to the story. Key words: to erupt, to reach the top, Greece and Pompeii. Answered the follow up questions on page 15. Students then created skits about each portion of the story. Card game: What were you doing at...? MDR: What did you do last evening? We talked about the different music genres that exist and took a poll of our favourites. We also talked about what punk music is and common motifs in the music. Song: SB pg. 12. Students corrected the verses and then wrote their own verses by substituting new words. MDR: What are natural disasters? Write as many as you can think of. Děti ve dvou skupinkách sestavovaly plán přežití za určitých přírodních pohrom, poté ho prezentovaly ostatním. Společně jsme si poté udělali kvíz, který zkoušel znalost různých plánů přežití. Today in class the students compared their homework, which was a scavenger hunt to find different things in the student's book. They completed the portfolio assignment, where they had to look at 10 pictures, and try to solve the mixed-up words to find the correct name for each picture. The new vocabulary is : shelf, goggles, instructions, apron, explosion, bubbles, test tube, liquid, gloves, powder. We started working from the student's book today on pg 4, with an introduction of the characters, and we started with the topic, "Science Lesson". We went over the vocabulary again, and the students tried to remember the definitions, and checked with the teacher when they were unsure. In the second half of the lesson, the students completed a logic puzzle on pg 5. Then they read comments on pg 7 from the three main characters and decided which picture of the character best matched their feelings in their comments. The students played an online game as a group on the projector, where they formed questions in the past simple verb tense. Then they reviewed the correct form and spelling of different verbs in the past simple, with a Spelling Race. The teacher wrote a present tense verb, and the two teams quickly wrote the correct past simple verb on the board (i.e. change "have" to "had"). Homework: from the workbook--exercise#1 of pg 4, ALL of pg 5, ALL of pg 7. Today in class the students completed their first portfolio assignment: 1. What are three things you like about EATS? 2. What is one thing you want to change? They shared their homework, three facts about grizzly bears, and those who finished the extra postcard work presented to the class. The class was given time to think about different things and then shared their ideas for the Grizzly Bears poster. Everyone planned out their ideas using pencil, and together began designing, drawing, colouring, and then added pictures of themselves. In the second half of class, the students finished their poster. Then the students played a game called Hot Potato, where they had a theme (i.e. "school subjects"), and had to each say a word related to the topic, without saying the same thing twice or taking too much time. We played several rounds of the game with different topics, to refresh their memories in English vocabulary. We reviewed the rules, and how stars, homework, and classroom jobs work. The students also played a game called "Change Seats", where they said something (i.e. "If you have a dog or cat...") and if it was true, they had to quickly find a new seat. In the second half of class, the students each got their new portfolio and spent some time writing their name and decorating the front cover. Then they all shared what they knew about bullying, and we reviewed some of the problems and solutions for different bullying situations. Then we all agreed as a class to prevent bullying, and signed a "No Bullying Allowed" certificate. 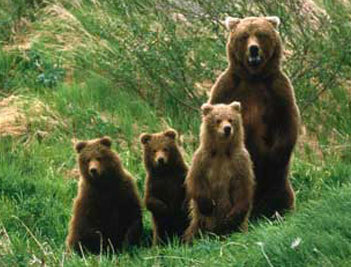 At the end of class, students talked a bit about the group animal, the grizzly bear, and what they know about it.